Your neck is the most vulnerable part of your spine. Not only does it support your 10 to 12-pound head, maintain a gentle forward curve, and permit head rotation, but it must also allow the free flow of nerve impulses to the head, face, hands and the rest of your body. Besides discomfort and annoyance, chronic neck pain is a sign that something is wrong. Improper telephone use is but one of many causes of neck pain. A thorough examination can reveal its likely cause(s) and suggest the best approach to optimum results. Many everyday things can cause neck pain, such as watching TV, using your computer, reading a book or falling asleep in a chair or on an airplane. The temporary pain that results can resolve on its own, especially when the offending activity is discontinued. When it doesn't, a more serious underlying problem may be indicated. While the giraffe has the same number of cervical vertebrae as you do, it lacks the gentle forward curve essential for turning and bending. Your cervical spine (neck) consists of seven small interlocking bones. Neck pain can be associated with a loss of forward curve. A thorough examination can determine if you're a good candidate for chiropractic care. These tests may involve your ability to turn and bend. Muscle tone of the supporting muscles in the neck and back may be tested. Diagnostic imaging to reveal the underlying structure of the spine may be requested. These and other tests are designed to identify the cause and location of your neck pain. The most common cause of neck is functional distortions in the spine resulting from vertebral misalignment. These are seen in cases of reverse cervical curve, whiplash and joint instability. The body responds by tightening muscles in the back and in the neck, "splinting" the joint to protect it from further insult. Chiropractic care can help. 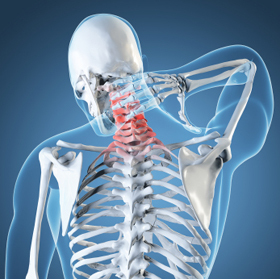 Most of the pain-sensing nerves in the neck are located in the pairs of facet joints on the backside of each vertebra. These smooth, interlocking surfaces allow you to rotate your head and bend your head up and down. If these joints become locked or fixated, neck pain can result. Chiropractic care can help restore proper joint motion in your neck. Ever meet someone who was a "pain in the neck"? Each of us is susceptible to our body's unconscious response to people and circumstances. These perceptions can show up as episodes of neck and back pain. If the weakest link in our bodies is our neck and back, stress shows up there. While chiropractic care cannot reduce the stress of your busy life, it can help improve your ability to handle and tolerate it. Without drugs! Without Surgery! Many patients are surprised when their chiropractic examination involves other areas of their body besides the local site of their symptom(s). Some neck and back pain cases can be compensation to problems in the feet, knees, hips and a lower back problem could be the root cause of your neck problem. Your chiropractor sees you as a whole person, not just a collection of "parts". Some patients see quick improvement and then immediately discontinue their care. They often suffer a relapse since muscles and soft tissues have not had time to fully heal. Others discover that degenerative changes to their spines make periodic checkups a worthwhile investment. We'll make recommendations, but how long you benefit from chiropractic care is up to you. Chiropractic is a team approach to better health. As you enjoy results, tell those you love. Explain how millions enjoy relief and better health by restoring the integrity of their spines and nervous systems with safe and effective Chiropractic care!